Lock two cabinet doors with one turn of the key. 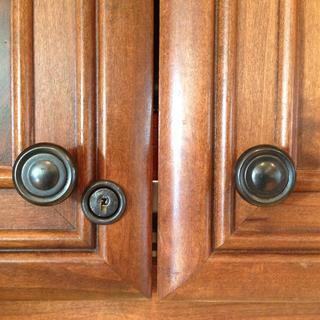 You can lock two cabinet doors with one turn of the key - a great convenience! No more fumbling with multiple locks and keys! 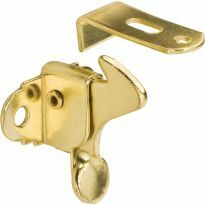 Great for quickly securing collectibles or other valuables as well as keeping items safely out of the reach of children. Use on 3/4" material. 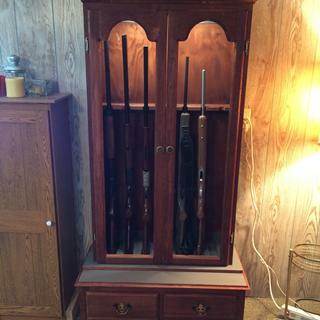 This is the perfect solution for my wife's costume jewelry closet. She is super impressed. Simple to install, works as advertised. I'd recommend this lock. Easier to install than those plastic 'childproof' things that the kids figure out anyhow! Used for lockimg cabinets with medications at medical office. Simple installation. I used 7/16 in. drill bit for main lock, fits snug. Love that all keyed alike. I bought this lock for a gun cabinet that I made and it worked very good. I'm sure I will be buying more of these for future projects. Worked great for our reception area cabinet. Easy to install. At first I was unsure of how I would install this lock. It turned out to be very simple and the result was great. Good quality lock and the door is secure. I needed locks to place on several two door kitchen cabinets. These locks have been in use about 6 months and are operated 3-10 times per day. They work flawlessly. I searched online for the perfect lock and then realized there was a Rockler store a short drive from my home. Of course I found a few other items I couldn't resist in the store. My only caution is to plan the installation very carefully to achieve the best results. Just the thing for a storage cabinet on wheels that we built for our local Hockey Booster Club. Quick, easy to install, well suited for their intended purpose. Multiple copies of the key to operate both locks, one two door lock on top and one on the bottom of the doors. Without a doubt, this is the BEST door lock available. Easy installation, sturdy and secure. I had to install two locks in a new veterinary hospital, in the vending room for our vendor, to keep his products safe in. I went to a cabinet shop that I had gotten them before, for the old hospital, but they discontinued selling the locks. I looked all over, Home Depot, Lowes Etc., could not find the kind I wanted to lock a double door. I went online and found your company and BINGO there it was, and even in 3/4&quot; for the size doors I needed them for. I am so happy I found you company because I'm sure I will need more in the future I put in nearly 40 in the old hospital. Thanks again for saving the day for me,Gavin Stobie Jr.PS:Very good quality also!!! While it is annoying that this lock comes with zero instructions, I was able to make my own template for the installation. My homemade template installed the lock a little to tight so I had to sand on the both of the locks' cams just a little bit to get things to work without rubbing. Great product as long as you have got the skill to make your own template I admit I only had just the minimum skill to make it work. The kind of quality you can rely on from Rockler. My only really concern is that I found a 5/8&quot; bore worked better than the 3/4&quot; suggested. 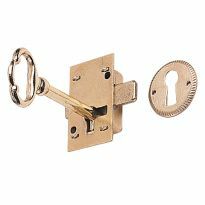 The lock set is supplied with a trim bushing that will sit on the face of the door snugly with the smaller bore. Otherwise a wonderful product. This is exactly what I needed, and Rockler was the only place that offered it. It is small enough, that with a little patience, I was able to combine it with the double door magnetic latch also offered from rockler. I used this on a double cabinet that will be storing prescription medications for a physical therapist. Other than the lack of instructions or template, this is a great product. It requires only a little forethought and measuring, but it works perfect and looks great. Very nice product, was exactly what I was looking for. Super easy to install, I only wish that it was offered in a silver finish also since the cabinet it went on had silver hardware. Shipped quick! Once again, Rockler comes through with a product that nobody else carries. Works great - and the online catalog provided me with enough information to know that what I was getting was the correct product. Works perfectly, I used them on some carts I built for an eagle project, and they are just perfect. Was just what I needed and easy to install. Very easy install, no instructions but none needed just simple carpentry skills. Item works great,works as advertised. Also I could only find this item at Rockler, not even the larger home centers had this. This is a good product. We would buy them more often if they came in polished chrome, and brushed nickel. It's a nice lock but should include corrected mounting instructions. The double door lock itself is nice. It does not come with installation instructions but my wife was able to find some on line from Rockler. BEWARE When she followed them measuring up 1" from the top of the base and drilling the 3/4"diameter hole through the door as shown, it did not take into consideration the throw of the lock bar which then required her to provide a notch in the base for the lock to travel into. The package come with two catches one for the opposite door and one to catch the cabinet case. If the instructions are followed you are unable to use the catch for the cabinet. but had to paint to match my hardware. Instructions for installing two strike plates was not provided, complicating the process. Rockler Double-door Lock painted with Rustoleum Universal Hammered Black spray paint. Easy to install but no instructions so, be careful. When I installed I forgot to add the thickness of the top plate and the lock wouldn't lock. I ended up having to grind a bit off the lock to make it work. The lock worked out great. Easy to install. I looked many places and could not find any thing that would work. Very easy to install. Rockler once again had what I needed. A very nice double door lock, but would greatly benefit if a template was included for ease of installation. Great lock. Easy to install and sturdy. I have installed these locks several times. For this specific application it is a very good design. This is a decent lock, but they need to include some instructions or a template for locating it because it takes forever to figure out all the clearances. Also it would be helpful to have a detailed picture of how the brackets are supposed to go in. Barrel rotates roughly. Key difficult to insert and remove. Lots of free play..............but it keeps the teenagers out of the cabinet. I bought these to lock liquor and medicine cabinets to prevent child access. Have cabinets behind home bar to store liquor in, away from kids. Looks like it will fit my need to convert a family heirloom cabinet into a liquor cabinet. Need to replace a broken lock that was similar. Looked like it would from the schematic. Would not have bought without the drawing. Two doors are better than one. Have used previously and have functioned well. This was the most suitable and cost effective means of locking two, library cabinet doors at the same time. To keep the kids out of a cabinet hiding the sump pump. Husband building a display cabinet. to avoid multiple door locks and its exactly what you need to lock a double cabinet door in this case, a public use kitchen. I have a home in Mexico and rent it out, therefore wanted to keep things there for private use and found this to be the best choice to lock my cabinet. because the one i ordered previously works just fine and i have another location that needs one, so.....i had no choice except to go with a reliable source. Appears to fit our application. Because you had a picture of the product in use! I have a cabinet that I am turning into a liquor cabinet. It has a double door on it. It most resembled the current lock we have on our cabinet doors. We needed a replacement. This looked like it will work for my application and the reviews are postive on it. I need a lock for my double door kitchen cabinet over my stove to lock up coffee and supplies for my airbnb. First lock I have seen like this. Little pricey but if it works the rest does not matter! Needed to replace the broken lock on a liquor cabinet. To secure companionway doors on sailboat. Not sure if this will hold up to the elements, but plan on liberal (and frequent) oil treatment to prevent corrosion. Making a 2 door cabinet that needs to lock and this seems to be what I had in mind. To rehabilitate a cabinet at the church. works perfect for locking cabinet doors. Was looking for something more secure for my coin collection, instead of buying an expensive safe. My cabinet door is not the specified thickness but I'm sure I'll be able to retrofit the product. Only one I've seen anywhere. can the keyed cylinder be replaced with another one with a different finish? are there other finishes available? Paint with Rustoleum Universal Hammered-Black spray paint to match oil-rubbed bronze hardware. Do I have to purchase these cabinet double door locks, keyed alike, or do I have the option to buy (3) locks keyed separately? BEST ANSWER: These are only available keyed alike. The two I bought (for two different cabinets) were keyed alike. I don't know if you can ask for them to be keyed separately. My door is 7/8 inch thick. Would this work even though it says 3/4 inch? BEST ANSWER: Since the double lock mounts onto the enter service of one of the doors it should match with the second door and work with little or no adjustment. The only adjustment would be to the frame around the top of the door, depending on its' thickness. If it's too thick try cutting a grove for the lock tongue, too thin build it up or modify the tongue. However; seldom does anything work perfectly without a little adjusting or modification or different screws. These locks worked great for me, with very little modification of installation for a special application. These are the only ones that did work to do what they advertised to do. They are holding up well, we're satisfied with them and the price. Yes, we would purchase them again. That is the only concern, however 1/8" can probably be made up with the threaded part not being totally used up. Or if possible a little sanding on the rear of the door where the lock mounts. 1/8" is not much to make up, but it's your call. Good Luck. You might have a problem with the extra 1/8". I would give it a try, I believe it will work with a little effort. What type and size drill is used to drill the hole for the cylinder and cylinder trim? BEST ANSWER: I used a 3/4" spade bit. Cylinder and trim fit perfectly. With the exception of the mounting screws is the only hold required the one for the lock itself? Also are the mounting screws included? BEST ANSWER: If I understand the question correctly, yes, the lock body itself is affixed to the back side of the door with 4 included screws. There are also two small strike plates to install, and appropriate screws are provided for these. The mounting screws are included for the lock assembly and the two strike plates. 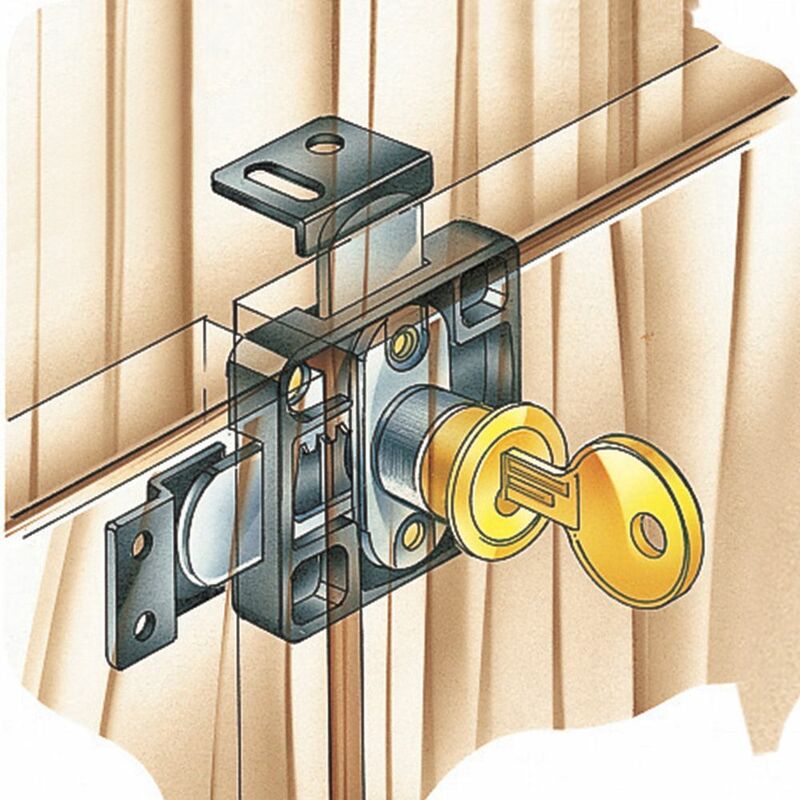 This lock is designed to be mounted in the corner of the cabinet door so it will lock both doors securely. I used this product. The only hole thru the cabinet door is the one for the lock. Included are screws for the lock it self and for the strikes. Do the strike plates come with the lock? BEST ANSWER: Yes, everything in the picture is included. Yes, as in the picture. Can this be used on an office hutch that has double doors with spring loaded magnetic latches? Can you flush mount these locks? The mounting instructions do not account for the top/bottom strike plate that is included in the kit. 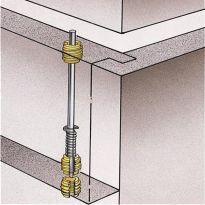 The instructions provide measurements for a grooved installation, but no instructions for installing the groove itself. 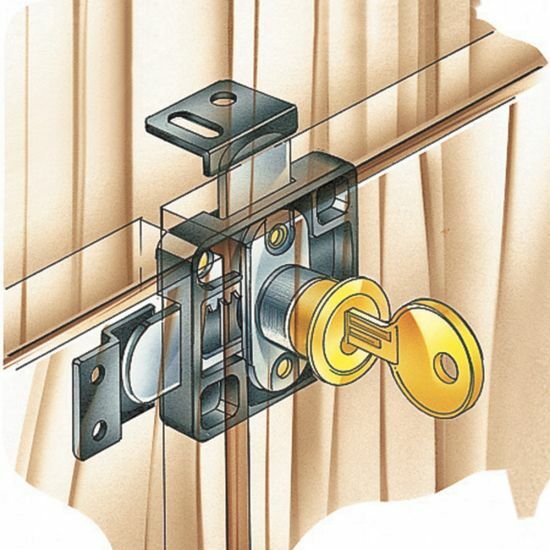 Yes, on the outside face you will just see the lock cylinder, flush, with a trim ring covering the hole edge, assuming you are using a 3/4" door, which the lock is designed for..
Can this lock two doors side by side? BEST ANSWER: Yes if installed on the top or bottom of door. Yes, that's what I used it for. Are the strike plates included or are they to be bought separately? BEST ANSWER: The strike plates are included, but instructions for mounting them properly are not. The strike plates came with them whem I purchaced them. Yes, the strikes were included. Can multiple locks be keyed alike? I received two of these locks in one order and they were already keyed alike. Can this lock be installed on double doors with center stile? BEST ANSWER: No, this lock is specifically made for doors that don't have a center stile. It cannot reach across a center stile. Yes I have installed them on doors with center stiles and without they worked on both. 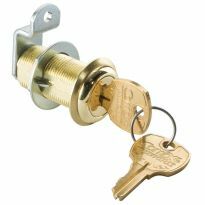 Need locks for full overlay cabinet doors? BEST ANSWER: That is what I purchased this for, and was the only thing that worked, and worked well. Can this lock be used on cabinet doors with no center style? BEST ANSWER: Yes, I installed it on a cabinet with no center stile, and it works well. That is exactly what the lock is made for; it is not made for doors that have a center stile. Depending on the size of the gap between the two doors, you might have to position the lock very carefully. You only get one chance to drill the hole, so precise measuring is mandatory. I made up a jig out of scrap wood to position the drill bit for the hole, and then installed the lock on some other scraps of wood just to be sure I had the position exactly right before I drilled the cabinet. Thank you so much for that. I thought it probably was made for that but wanted to ask someone else who had installed it as well. Yes I used them that way. I just installed them at the top or bottom of the door. BEST ANSWER: I have purchased a few of these locks at different times for our church. When I purchased them my concern wasn't that they were keyed alike. However I discovered that the locks all have the same key. How secure is the lock? 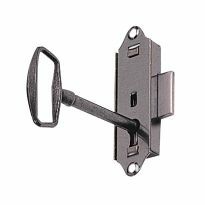 What style of lock does it come with? 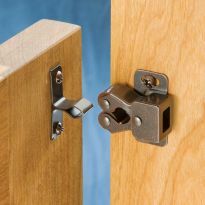 BEST ANSWER: It will depend on how secure your screws are that hold the brackets and what material you are going into, but for a wooden cabinet door function you may want to add a bolt latch to the bottom of one door to add security. Does the lock cylinder contain plates or tumblers? What colors does this item 35940 come in ? BEST ANSWER: Mine is gold / bright brass. Is there a matching Single door lock I can buy ? Does this come in chrome or nickel finish? How wide a gap between doors will it handle? Can the lock cylinder be changed for a deeper one? My doors are about 1.5" thick. what's the thickness of the mounting plate, and how long is the cylinder? What's the measurement of the back of the key plate to the very back of the mounting plate?